In 1983, the United States Golf Association (USGA) Turfgrass Research Committee and the Michigan State University (MSU) Libraries agreed to design and develop a bibliographic computer database to provide access to all published materials reporting on aspects of turfgrass and its maintenance. The project, known as the USGA Turfgrass Information File (TGIF) database, is located at MSU due in large part to the prior existence of the O. J. Noer Memorial Turfgrass Collection. 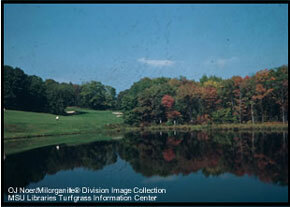 As much of the turfgrass literature is widely scattered across a variety of sources that may not be generally available to many turf managers and students, TGIF's goal is to provide quick access to published and electronic resources for users across the world and ultimately to all published materials reporting on aspects of turfgrass and its maintenance. Materials represented (indexed) in the TGIF database include articles from peer reviewed publications, technical reports and conference proceedings, trade and professional publications, local professional newsletters, popular magazines, monographs, theses and dissertations, fact sheets and brochures, images, software, and web documents. TGIF indexes material from governments, colleges/universities, professional organizations, and private publishers. Coverage emphasizes English-language materials but does include coverage of non-English languages. To produce TGIF, TIC monitors the turfgrass literature, regardless of sector, context, geography, or language. TGIF can therefore produce excellent searches on transitional overseeding, cricket wicket preparation, kikuyu grass invasion, gray snow mold control, sod production in Florida, or variety trial results in German. The Turfgrass Information Center (TIC) and the continued expansion of the TGIF database have been supported by membership and user fees, donations, and the MSU Libraries' support. An Endowment exists to stabilize the long-term basis for the Center's efforts - we actively seek organizational, institutional, industry, and professional support. In order to build TGIF, hundreds of journals, magazines, annuals, etc. 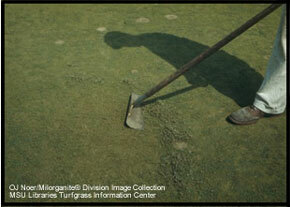 are selectively monitored on an on-going basis to identify items potentially relevant to turf culture. The periodical turfgrass literature is made up of a wide range of published material, and is about 90% of TGIF's content. To understand this better, we break the literature into publication types, which provides the ability to better parse the literature. This parsing allows each publication type to be individually searchable in TGIF, or conversely, excluded from a search. TGIF records are created at the lowest level of discreteness possible, based on the published item. In TGIF this is most typically an individual magazine or journal article, but it could also be a book chapter, an entire book, or a subsection of a conference proceeding presentation, etc. Due to these variations, TGIF records vary in their appearance and structure as not all possible fields will appear in every TGIF record. In some cases a specific field is not relevant to a given record, and in others it was possibly not done for that record at the point in time that the record was processed. Database structures have evolved in the past and will continue to evolve in the future, so what is seen in TGIF records are snapshots taken through time, just like the literature itself. Time permitting, TIC can and does update older records. Sample TGIF records to look over. TIC databases utilize a standardized vocabulary to "subject index" TGIF records. Assigned keywords (also known as index terms, descriptors, or "tags") are specified within The Turfgrass Thesaurus. Searching only the assigned index terms can result in a highly precise topical search, but it is not the only option. TGIF does not contain everything ever written on turf - someday, perhaps! Older materials may be less likely to appear in the database, particularly pre-1972. Historically, we have prioritized adding newer materials before older materials, using a variety of construction methods to build the TGIF database; some move rapidly, some more slowly. As time permits, we "retro process" these older materials. Use the Beard Bibliography to identify the remaining older material. If the item wasn't formally published and made available for circulation in some way it may not be in TGIF. For example, internal corporate research is generally not reported. We define "published" as "reproduced and distributed in a public setting." Although a particular article might be useful for a turf manager in a particular situation, it does not mean it will get input to TGIF. There are many functions of turf managers that fall outside TGIF's scope of coverage. Examples include personnel management, equipment repair, and communications skills. The same holds true from a research perspective. Other more traditional agricultural online resources (e.g. AGRICOLA, CABA, AGRIS) may provide access to this "broader" context. Unless the item is directly related to turf culture or turf facility maintenance, it may not be found in TGIF. There are items in the TGIF database which are not part of the current physical or digital collections at the Turfgrass Information Center or the Michigan State University Libraries. We create records for items which we do not own but which are part of the literature. These will display with a "WANTED! Help Us Please..." annotation. If you see items like this listed in TGIF, please help us acquire a copy! All information provided within the TIC online systems including TGIF is for educational purposes only. References to commercial products or trade names do not constitute endorsement by Michigan State University nor bias against those not mentioned. TIC information resources are intended for use by an audience capable of information evaluation, recognizing that a wide range of opinion is represented in the data sets including contradictions, controversial, and/or outdated references. Such is the nature of professional and research literature! To aid with navigating the Turfgrass Information File (TGIF) database, there is a compiled resource list available for database users including a tutorial video, a "Getting Started" guide, and an academic worksheet intended for classroom sessions.